1 - Why Choose SpaMedica? 8 - Does it Work? SpaMedica offers the most extensive range of nonsurgical liposuction and noninvasive fat reduction devices in Toronto and Canada. Our non-invasive fat reduction program is tailored to your needs to ensure the best fat reduction results possible. SpaMedica guarantees a visible difference following the nonsurgical liposuction program, or you will receive a complimentary treatment. Are You A Nonsurgical Liposuction and Fat Reduction Candidate? If you have answered Yes to any of the above questions then you are a perfect candidate for nonsurgical liposuction treatment. SpaMedica offers various nonsurgical liposuction and body contouring procedures. If you have unwanted fat that you are struggling to get rid of, there is no one way to best nonsurgically destroy permanently localized areas of unwanted fat. In fact, there are multiple excellent technologies that have proven ability to kill fat cells nonsurgically and they all work in a different way. So to get the absolute best result, greatest fat cell reduction in that localized collection you do not like, you will have to combine a few modern technologies to get the best results. At SpaMedica, Dr. Mulholland has been at the forefront of the development of these technologies and owns them all, so your SpaMedica nonsurgical liposuction coordinator can customize the best multi-technology fat reduction program for you. How does the combined nonsurgical liposuction fat reduction program work? Toronto nonsurgical liposuction patients seek out Dr. Mulholland and SpaMedica for the unparalleled access to the best technology, best experience and best outcomes. SpaMedica offers you the best combo treatment experience at very affordable prices. By combining CoolSculpting (freezing the fat cells), SculpSure (heating the fat cells), with high-frequency focused ultrasound in the form of the UltraShape® (cavitating the fat cells), together with bulk heating radiofrequency technology, like the BodyFX, SpaMedica is able to offer you the highest possible concentration of fat cells that can be permanently killed and the best possible skin tightening and nonsurgical fat reduction in your localized area of fat collection. The CoolSculpting and/or SculpSure is combined with the BodyFX and/or Ultrashape program for an additional 6 weeks. Treatments are done once weekly for 6 weeks. BodyFX will kill fat cells, deliver fat reduction and tighten skin, while the Coolsculpting, SculpSure and Ultrashape will enhance the amount of permanent fat reduction. Other high-frequency focused ultrasound technologies such as Liposonix®, also provide a vertical depth focus of thermal destruction of fat cells similar to that which can be achieved with the non-thermal cavitational effects of UltraShape®. At the end of the program many patients turn their attention to sculpting other areas of their body or adding one more CoolSculpting and SculpSure to the area to optimize the outcome. Do I have to do all the different technologies and treatments? No, some patients do not need all the treatments and sessions because they may have a small amount of fat or tight skin. The SpaMedica nonsurgical liposuction program will be customized to suit their soft tissue characteristics and expectations. Some just do CoolSculpting or SculpSure and assess their results before deciding if they want to add other components and technologies to their nonsurgical liposuction program. CoolSculpting, from Zeltiq, as the name implies, is a suction coupled device that uses very cold temperatures to freeze your unwanted fat cells painlessly. There are various treatment applicators that can be applied to the areas of unwanted fat, most commonly the abdomen, hips, outer and inner thighs, arms and bra line. There is even a Coolsculpt “mini” for the double chin! CoolSculpting can reduce 2-4 cm of fat comfortably and predictably and affects up to 22% of the fat cells in the treatment zone. There is no downtime and 2 treatments, 6 weeks apart are usually required. SculpSure: SculpSure from Cynosure, uses gentle heat (hyperthermia) to gently kill the fat cell in localized unwanted collections. Like CoolSculpting, the SculpSure has a series of 4 applicators that can be configured around different unwanted fat collections. Each of the 4 applicators delivers a gentle laser energy (the 1060m diode beam) to heat the unwanted localized fat collection. Through the high tech use of cooling the applicator surface and temperature-energy cut off loops, the SculpSure is able to maintain the fat temperature at 45-47 degrees for 25 minutes, which induces a fat cell death. Up to 24% of the fat cells in the treatment field under the applicator will die. There is no downtime and two treatments, usually 6 weeks apart is required. UltraShape (Ultrasound and cavitate your fat away). Ultrashape uses gentle pulse, focused high frequency ultrasound waves to damage the cell membrane, a process called cavitation, which results in the death of the fat cell. UltraShape high frequency focused ultrasound (HIFU) are painless, safe and effective in reducing 2-4 cm of fat. Treatment usually last 20 minutes per zone and there is no downtime. 3 treatments are usually required, 2 weeks apart and you are done in 6 weeks. BodyFX (Electroporate your fat cells away): The BodyFX is a suction coupled device that releases a special high frequency and voltage short pulse of Radiofrequency current that destroys the fat cell painlessly through electrical damage to the fat cell membrane called irreversible electroporation, or IRE. The BodyFX also emits standard radiofrequency energy to tighten your skin. Just like when you are considering liposuction, you need to tighten skin as well as shrink fat, BodyFX will do both, as studies show after 4-6 treatment up to 429cc of destroyed fat and 15-25% more collagen production. What kind of results can I expect with a nonsurgical liposuction treatment program? At SpaMedica, optimal results are achieved by combining the best possible fat reduction and skin tightening technologies that have peer-reviewed permanent fat reduction studies and benefit to back them up. By combining technologies, you will achieve the best possible permanent fat reduction and nonsurgical lipo results available on the market today. There is not one technology, from the radiofrequency bulk heating fat contouring device family, from the focused ultrasound family, the hyperthermia SculpSure, or even the hypothermal CoolSculpting® Zeltiq family of devices that delivers a consistent, best-in-class permanent fat reduction all by itself. Dr. Mulholland has found with his extensive experience that by combining the best technologies in a programmatic fashion, one can achieve optimal fat reduction and skin tightening results. The kind of results that are commonly achieved in the average individual range from two to six centimetres of circumferential, permanent fat reduction in the abdominal region, with 700-800 cc of fat killed, to three to five centimetres in the inner and outer thigh region. This roughly equates to one dress or pants size reduction following the program. Because of SpaMedica’s combined technology, nonsurgical liposuction and permanent fat reduction program results in a death of the fat cells. These fat cells will not return, will not store carbohydrates and will not re-expand. As such, as long as patients maintain their pre-program weight, the contour improvement of focal fat reduction is permanent in nature and the results will be permanent. However, weight gain and excess carbohydrate intake will result in the expansion of those cells that are left in the area of the contour improvement and these cells, as well as other fat cells in your body, will swell following weight gain and tend to ruin the aesthetic contour results. So, weight maintenance, just as in liposuction surgery, is important following the program. There’s no specific maintenance to maintain the permanent fat reduction (other than avoiding weight gain) that was achieved during the program. However, as mentioned during the description of the program above, SpaMedica combines bulk heating radiofrequency technologies in addition to focal fat reduction technology for fat reduction and skin tightening. The reason the bulk heating radiofrequency is deployed, in addition to fat reduction, is to tighten the skin and result in skin and soft tissue contraction. As the fat contour is improved, it is important to tighten the overlying skin to avoid any obvious skin laxity. The skin tightening that occurs from the radiofrequency devices discusses above will result in approximately 15% to 20% thickening of the dermis with new collagen and elastin. How much will my SpaMedica nonsurgical liposuction permanent fat reduction program cost? There’s a range of fees depending upon the number of zones treated and the size of each zone. However, in general, the series of treatments with combined technologies start from $2,500 for the first zone. This program will include the 3 BodyFx treatments and/or 1 UItraShape treatment over the 6 weeks. The second and third zones, which are often combined, can be purchased at a lesser price. In general, the SpaMedica nonsurgical liposuction program costs approximately one-third of what you would spend with Dr. Mulholland doing specialized liposuction surgery, such as high tech SmartLipo™ or BodyTite™ minimally-invasive liposuction treatments. They are effective at reducing stubborn areas of unwanted body fat. No incisions are required for treatment. Are there any contraindications to the SpaMedica nonsurgical liposuction program? Contraindications to CoolSculpting, SculpSure, BodyFX and Ultrashape fat reduction treatments include patients who may be pregnant at the time of the procedure, patients with a pacemaker that is required for normal heart rhythm or the presence of inflammatory lesions, infection or skin cancers in the area of treatment. There are some rare blood abnormalities that cause problems when your blood is cooled, such as Cryoglobulinemia, that may not render you as a candidate for the CoolSculpting portion, but the rest of the program is still applicable. What kind of anesthetic is used during the SpaMedica nonsurgical liposuction and fat reduction treatment program? Toronto nonsurgical liposuction patients undergoing fat reduction using the non-invasive body contouring technologies require no anesthesia. No topical local anesthetic is required as the CoolSculpting, SculpSure, UltraShape, the high-frequency focused ultrasound technology and the BodyFx™ bulk heating radiofrequency technology are well-tolerated and relatively painless. Is the nonsurgical liposuction program with CoolSculpting, SculpSure, Ultrashape and BodyFx painful? Toronto Fat Reduction patients undergoing nonsurgical liposuction at Toronto’s SpaMedica can expect a very comfortable treatment experience. Virtually all aesthetic treatments with permanent effects, such as BOTOX®, soft tissue fillers and ever laser hair removal have a modest degree of discomfort. The SpaMedica Toronto nonsurgical liposuction program has a similar, minimal degree of acceptable discomfort in order to get permanent fat reduction and death in a non-invasive fashion. How long does the nonsurgical liposuction program take? SpaMedica’s nonsurgical liposuction, permanent fat reduction program is relatively time-efficient. Each treatment takes approximately 30-60 minutes, depending upon the size of the areas. Fat reduction treatments are performed once a week for six weeks to achieve the full benefit and effect of the nonsurgical liposuction permanent fat reduction, as well as skin tightening. There is most commonly one CoolSculpting treatment per area, one SculpSure treatment per area, 6 BodyFX treatments in the program and 3 UltraShape treatments. How long is the recovery following each fat reduction Ultrashape or Bodyfx treatment? Dr. Mulholland has been careful to design a program that is ultimately flexible for today’s active patient. The SpaMedica nonsurgical liposuction program with permanent fat reduction has no real down time. The area of treatment with the Coolsculpting, the SculpSure, the bulk heating radiofrequency, high-voltage pulsed device, the BodyFx™ and the high-frequency focused ultrasound technology, the UltraShape®, are both well-tolerated. There’s a minor degree of redness and swelling after each treatment but patients can return to activities of daily living, any clothing and even high-impact aerobic activity immediately following the treatment. How do I schedule a SpaMedica nonsurgical liposuction, fat reduction consultation? To schedule a nonsurgical liposuction fat reduction consultation, simply call 877-712-8367 or book an appointment online by clicking the "Book A Consultation" button. A SpaMedica representative will contact you promptly after filling the form so you can begin your journey towards a new figure, shape and form. Why choose SpaMedica and Dr. Mulholland for my fat reduction treatments? At SpaMedica, Dr. Mulholland has assembled the best possible technologies to deal with the permanent reduction of fat in the areas of focal contour concern. Not only will you experience the best possible technology with the most experience at delivering that technology, at SpaMedica, Dr. Mulholland offers his Toronto nonsurgical liposuction and fat reduction patients a significant value-offered coupon of the fees spent in the nonsurgical program to apply against SmartLipo™ or BodyTite™ minimally-invasive liposuction surgery to further enhance the result, if at any future point a patient should choose to improve upon the fat reduction results achieved. Don’t forget that at SpaMedica Toronto, we guarantee a visible difference following the nonsurgical liposuction program, or you will receive a complimentary treatment. 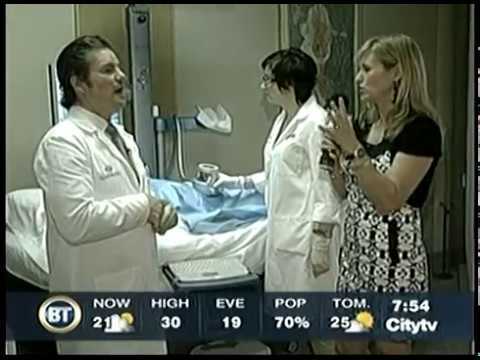 Dr. Mulholland is also one of Canada’s foremost liposuction surgeons. All SpaMedica non-surgical liposuction patients have up to 5 years to apply a portion of their program cost against any of SpaMedica’s high-tech liposuction techniques, including: BodyTite, SmartLipo and VaserLipo.